We often delete our useful blog posts accidentally and need to recover them. It looks so much difficult and challenging task but actually it is so easy to recover our blog posts. There are many different ways to recover our blog posts like from hosting servers or any others but they are so much difficult. A few days before,one of my friend deleted all of his blog posts accidentally and the posts are over 40+. He is so much worried that time and tell me his problem then i tell him this trick to recover deleted blog posts and he recovered all of his posts in just 2 days. He told me to share this trick with all so I am sharing this amazing and small trick to recover deleted blog posts. So let's start rolling your fingers on the trick. Paste the URL of that post which you want to restore, if you haven't the URL write the deleted post or page title or keyword to find out that post in search results. When you find it in search results, just after the title there is a small drop down icon click on it as shown below. After clicking on Cached you will access to the original post. Now there is two options to restore it. 1) Create a new post and copy-paste and to publish it again, but this method can cause copyright issues. 2) Access to original post by using source code and It is more suitable too. To use second method follow these steps. Now log-in to your blogger account and past the following URL in your browser search bar. Replace the red highlighted number with your post ID. Click on publish and now your deleted post or page is again live on the same URL. Finding Your Blog ID is just so simple task you can find out your Blog ID in any link on your blog dashboard. Go to Blogger.com and select your Blog Overview Tab. 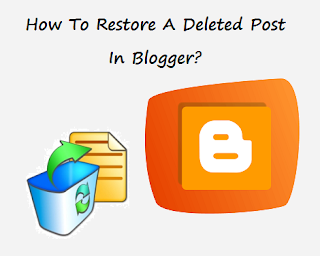 So that's the easy steps to recover your deleted blog posts. Now It's your turn to share this post with your friends and write your feedback in comments till then Peace, Blessings and Happy Recovering.